Similar traffic charges are already used in cities like Singapore, Stockholm, London and Milan, but New York has rejected or ignored versions of them dating to at least the 1970s. The newest plan embraces the twin goals of easing Manhattan’s choking traffic while raising badly needed revenue for the city’s failing subways and buses. Trucks would pay $25.34, and taxis and for-hire vehicles could see surcharges of $2 to $5 per ride. The pricing zone would cover Manhattan south of 60th Street. In a key change from past efforts, drivers would not have to pay if they entered Manhattan by all but two of the city-owned East River bridges, which are now free to cross, as long as they bypassed the congestion zone. The proposals are part of a report by a task force, “Fix NYC,” convened by Governor Cuomo after he declared a state of emergency in the subways last June. The report says that the fees on taxis and for-hire vehicles could be put in place within a year, followed by trucks and then cars in 2020. None of those fees should be charged, the task force said, until repairs are made to the public transit system. “Before asking commuters to abandon their cars, we must first improve mass transit capacity and reliability,” a draft of the report says. Most of the plan would require the approval of the state legislature, which is expected to receive it Friday. In announcing his support last summer for congestion pricing, Mr. Cuomo said the Metropolitan Transportation Authority, the region’s umbrella transit agency, needs a new, reliable source of funds. Depending on how the prices are structured, the task force estimated that up to $1.5 billion could become available annually. With New York’s population at an all-time high, its streets snarled by mounting traffic and its famed public transit system in steep decline both above ground and below, it has become increasingly apparent that the city is choking on its own growth. Mr. Cuomo is gambling this proposal will succeed where earlier attempts have failed, though the dire transit situation, as well as improvements in technology, give it a far better shot at becoming reality than past attempts. 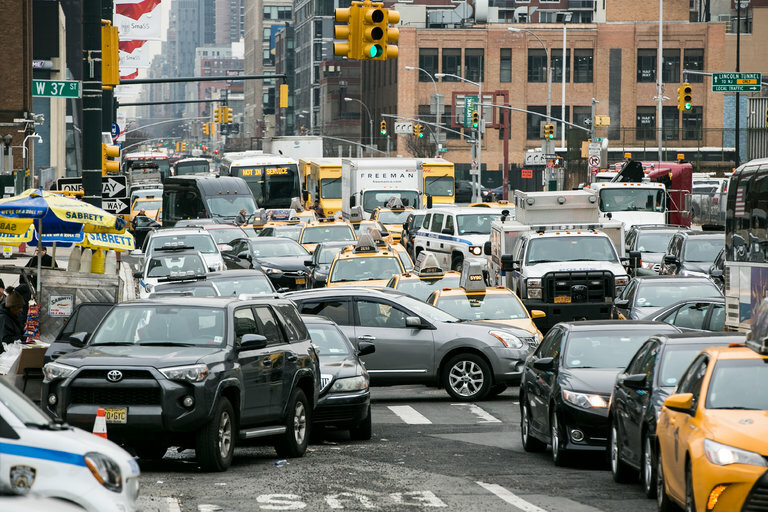 “New York City traffic congestion now ranks second worst among cities in the United States and third worst among cities in the world,” a draft of the report says. If not abated, the congestion will cost the economy of the metropolitan area $100 billion over the next five years, the task force estimated. The governor is picking up a cause that was championed by former Mayor Michael R. Bloomberg in 2008, but that met stiff resistance. It died in the State Assembly without coming to a vote. The current mayor, Bill de Blasio, has said that he favors a tax on millionaires and has argued that congestion pricing hurts the middle class and poor who live outside Manhattan and drive into it. The report dismissed those claims, saying only 4 percent of residents of other boroughs commute to jobs in Manhattan in a vehicle, or approximately 118,000 residents. Of those, it said, more than half were higher income individuals, and fewer than 5,000 of them would qualify as working poor. As important as the study has been for the city, the openly hostile relationship between the governor and the mayor was reflected in the makeup of the task force: Of its 15 members, none are from the de Blasio administration. The report called for increased traffic enforcement by the city, and said the distribution of official parking placards should be subject to a joint review by city and state officials. People who live within the congestion zone would not be exempt from the new fees. The new plan reflects a changed technological and political landscape since Mr. Bloomberg’s effort. It was described by people familiar with its details who asked not to be identified because it has not yet been presented to state legislators. New technology can identify vehicles on any roadway and automatically charge them, so the task force was able to draw a narrower — and perhaps more politically palatable — cordon limited to the most crowded streets. In turn, that means drivers can enter Midtown and Lower Manhattan by two bridges without paying as long as they go directly to the F.D.R. Drive along the East River and then continue on it until they are out of the congestion zone. With current street configurations, that is possible only at the Edward I. Koch Queensboro Bridge at East 59th Street and the Brooklyn Bridge downtown; coming into Manhattan via the Manhattan and Williamsburg Bridges, drivers are only able to continue into streets covered in the zone. The crisis in the transit system may also make it easier for Mr. Cuomo to sell the pricing plan to the legislature. When Mr. Bloomberg made his pitch a decade ago, the transit system was in far better shape. In fact, the Bloomberg plan was intended to address surging ridership and anticipated the budget pressures that led to maintenance cuts. Since then, the city’s traffic problems have also worsened, even though fewer vehicles are driving into the central business district, the report said. In expanding and creating bicycle lanes and pedestrian malls, the city has decreased driving lanes for vehicles. The iPhone, released in 2007, led to an explosion of Uber and ride-hail cars that jam streets in Midtown and Lower Manhattan. Truck deliveries and rampant construction routinely block traffic. Midtown traffic now crawls at an average of 4.7 miles per hour, down from 6.5 miles per hour five years ago. Ever more pedestrians and cyclists are fighting for elbow room on crowded sidewalks and streets: The city’s population of 8.5 million has increased by a half-million since 2000. An estimated 60 million tourists visited last year, up 25 percent since 2010. The gridlock is not only a problem for commuters. Kathryn Wylde, the president and chief executive of the Partnership for New York City, a group of top business leaders, said that longer commutes and work trips resulted in lost productivity, increased business costs, and higher fuel and vehicle expenses. In an analysis released this week, the partnership calculated that worsening congestion now costs the New York region about $20 billion annually, up from $13 billion annually in 2006.